This is the cake that professional organizer Standolyn Robertson always baked for her kids when they made the honor roll at school. Read more about it in Melanie Mesaros' story "Ducks in a row." Preheat oven to 350 degrees. Grease and flour an 8-by-8-by-2 pan. Sift together dry ingredients into a medium bowl and set aside. With an electric or stand mixer cream butter (or shortening) and sugar until fluffy. Add egg and vanilla to butter-sugar mixture and mix until blended. Gradually add the dry ingredients, alternating with the milk, beating on low speed. Once all the ingredients are added, beat for 30 seconds on high speed, just enough to incorporate all the ingredients smoothly. Pour cake batter into prepared pan and bake for 35 to 40 minutes, or until a toothpick inserted into the center comes out clean. 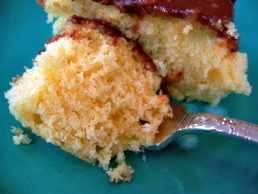 To make the icing, sift the confectioners' sugar into a medium-large bowl. Add the softened butter to the sugar and beat until smooth, then beat in the vanilla, milk, and cooled chocolate. Spread icing onto the cooled cake. Cut into squares to serve.